Start off your visit on the 7th (Sun): take in the architecture and atmosphere at St. Vincent's Church. Here are some ideas for day two: take in the architecture and atmosphere at Eglise Saint-Nazaire, steep yourself in history at La cité médiévale, then wander the streets of Historic Fortified City of Carcassonne, and finally explore the historical opulence of Chateau Comtal. 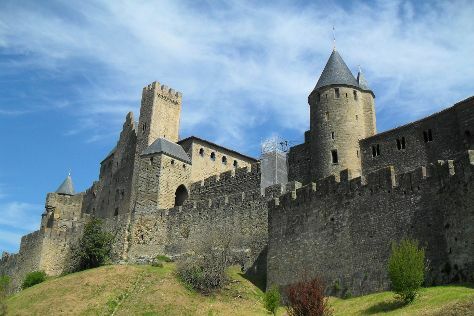 To find where to stay, reviews, other places to visit, and tourist information, use the Carcassonne Center sightseeing planner. Belfast, UK to Carcassonne Center is an approximately 6.5-hour combination of bus, flight, and shuttle. You can also do a combination of flight and shuttle; or do a combination of bus, flight, and train. Traveling from Belfast to Carcassonne Center, you'll lose 1 hour due to the time zone difference. Expect a bit warmer temperatures when traveling from Belfast in July; daily highs in Carcassonne Center reach 33°C and lows reach 20°C. Wrap up your sightseeing on the 9th (Tue) to allow time to drive to Sarlat-la-Caneda. Kick off your visit on the 10th (Wed): step into the grandiose world of Chateau de Beynac, then explore the striking landscape at Les Grottes de Maxange, then explore the historical opulence of Chateau des Milandes, and finally explore the historical opulence of Chateau de Castelnaud. On your second day here, steep yourself in history at The Maison Forte de Reignac, then paddle through the water with a kayaking and canoeing tour, then contemplate the long history of Roc de Cazelle, and finally contemplate the long history of Chateau de Commarque. To find more things to do and other tourist information, go to the Sarlat-la-Caneda trip site . Traveling by car from Carcassonne Center to Sarlat-la-Caneda takes 3 hours. Alternatively, you can take a train; or do a combination of bus and train. Plan for little chillier nights when traveling from Carcassonne Center in July since evenings lows in Sarlat-la-Caneda dip to 17°C. Finish your sightseeing early on the 11th (Thu) to allow enough time to travel to Avignon. Get some historical perspective at Palais des Papes and Pont d'Avignon. Do some cultural sightseeing at Abbaye Notre-Dame de Senanque and Amphitheatre (les Arenes). Change things up with these side-trips from Avignon: Chateau de Lourmarin (in Lourmarin), Pont du Gard (in Vers-Pont-du-Gard) and Carrieres des Lumieres (in Les Baux de Provence). There's still lots to do: don't miss a visit to Vieille Ville de Gordes. To see more things to do, photos, and tourist information, you can read our Avignon trip maker . Traveling by combination of flight and train from Sarlat-la-Caneda to Avignon takes 4 hours. Alternatively, you can drive; or do a combination of train and flight. Traveling from Sarlat-la-Caneda in July, expect a bit warmer with lows of 20°C in Avignon. Finish your sightseeing early on the 14th (Sun) to allow enough time to take a train to Marseille. On the 15th (Mon), explore the striking landscape at Calanques, get to know the fascinating history of Vallon des Auffes, then contemplate in the serene atmosphere at Basilique Notre-Dame de la Garde, and finally take in the spiritual surroundings of Abbaye Saint Victor. To find traveler tips, photos, other places to visit, and tourist information, read Marseille trip builder website . You can take a train from Avignon to Marseille in an hour. Other options are to drive; or take a bus. In July in Marseille, expect temperatures between 36°C during the day and 23°C at night. Finish your sightseeing early on the 15th (Mon) so you can drive to Saint-Tropez. Saint-Tropez is a town, 100km west of Nice, in the Var department of the Provence-Alpes-Côte d'Azur region of southeastern France. Relax by the water at Plage de Gigaro and Plage de Pampelonne. Visiting Scuba & Snorkeling and Plage de Jean Blanc will get you outdoors. Change things up with a short trip to Plage de Sylvabelle in La Croix-Valmer (about 34 minutes away). There's still lots to do: enjoy the sand and surf at Plage de l'Escalet, stroll through Plage des Marines, and step into the grandiose world of Chateau de Grimaud. For ratings, photos, traveler tips, and tourist information, you can read our Saint-Tropez holiday tool . Traveling by car from Marseille to Saint-Tropez takes 2 hours. Alternatively, you can take a train; or do a combination of train and bus. In July, daytime highs in Saint-Tropez are 38°C, while nighttime lows are 20°C. Finish up your sightseeing early on the 18th (Thu) so you can go by car to Cannes. Get in touch with nature at Scuba & Snorkeling and Swim with Dolphins. Deepen your sense of the past at sights like Lérins Islands and La Croisette. Venture out of the city with trips to Nice (Eglise Saint-Jacques-le-Majeur & Vieille Ville). There's still lots to do: explore the galleries of Chateau de la Napoule / Musee Henry-Clews. For other places to visit, ratings, and other tourist information, use the Cannes trip planner . Traveling by car from Saint-Tropez to Cannes takes 1.5 hours. Alternatively, you can do a combination of bus and train. When traveling from Saint-Tropez in July, plan for a bit cooler days and about the same nights in Cannes: temperatures range from 33°C by day to 21°C at night. Cap off your sightseeing on the 21st (Sun) early enough to travel back home.